Hellcat Press What is Dolly Reading? Artist Paula Richley has designed some excellent promo art for us! As you can see, Dolly has managed to get an advance copy of Dark Lady (don’t ask us how! It hasn’t even been printed yet!) and is perusing it. Little does Dolly realize that she’s got a stalker – the mysterious HellCat keeps watch over Dolly and her new book. Check out Paula’s other art here: www.OtherRealmStudio.com. 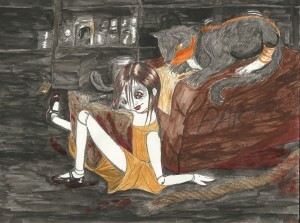 We’ve also got some excellent cover art from contributor Lisa Pearson. We simply can’t wait for these lovely and spooky images to grace the covers of Dark Lady! 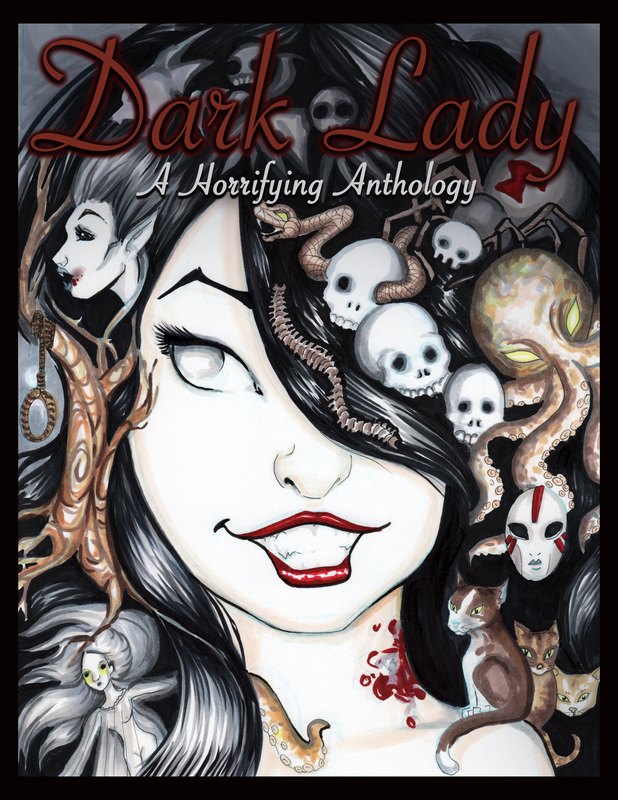 The Dark Lady Adorned With Monsters will be making her unofficial debut alongside Dolly and the HellCat at the Maine Comic Arts Festival next month. We’ll be handing out postcards and bookmarks bearing their eerily beautiful visages to promote and raise funds for Dark Lady.